The new owners of the Astoria have submitted plans to knock it down and build scores of flats aimed at people who can’t afford Brighton’s high rental prices. 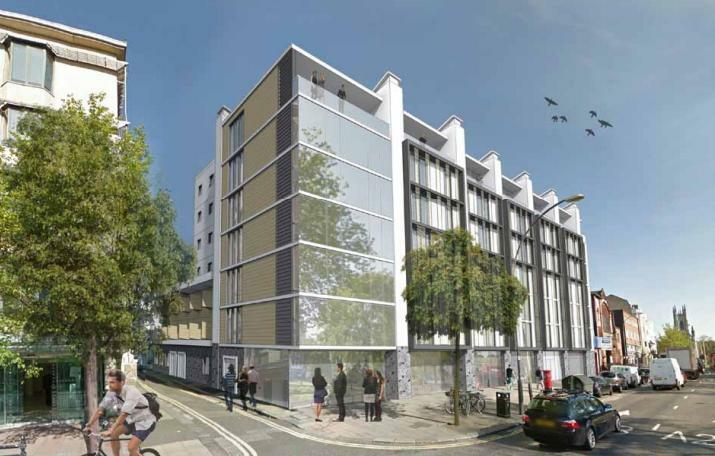 Unicity, the new arm of Knightsbridge Student Housing, has applied to put up a new building of 73 flats, communal areas and 310m commercial floorspace. It is basing its scheme on the “private rented sector” model of self contained flats with extensive communal facilities, including a dining room, gym, garden, guest bedroom – and in an echo of the building’s former use, a cinema room. No car parking will be included as the site is on a “green transport corridor”, but at least one cycle parking space per apartment will be provided. As part of the application, Knightsbridge Student Housing says: “We believe the Private Rented Sector (PRS) product has the potential to be a significant solution to housing large numbers of people, particularly when delivered at scale and in concentration in the right areas. “The importance of land and development density is particularly critical in areas with growing populations and shortage in housing land supply. The Grade II listed art deco former cinema was sold in December to Knightsbridge by developer Mike Holland. Two previous applications made by Mr Holland for shops and offices, and shops, offices and six flats, were approved. Mr Holland also secured listed building consent for the cinema’s demolition, which is still valid. The Knightsbridge application, written by Lewis and Co Planning, says: “The current application proposes a far higher number of residential units than for the extant planning permission. “At the time that planning application was made in November 2013, the council was maintaining that it could demonstrate a five year supply of housing land. “However, in December 2013 the inspector for the emerging city plan … made it very clear that the council could not demonstrate a five year supply of housing land and that the need for additional housing was pressing. How utterly ghastly! Does anyone really think this is good enough for Brighton or Brighton needs any more shops? Brighton will soon look like Basingstoke at this rate. Couldn’t agree with you more Laura. Another boring, vernacular contemporary structure replacing a gem under the guise of progress and need. Brighton has already lost much of it’s unique architectural heritage and in the process is eroding it’s character. Don’t let this happen! Basingstoke or Legoland by the sea! I ask him to explain why , after 25 years, no-one has managed to find a use for this dinosaur from the thirties. Sometimes its time to move on, to provide for the needs of contemporary society not to cling to a building whose time has been and gone. I would support retaining the facade but unfortunately I doubt it would be possible. As someone who grew up in Basingstoke I know how bad this is.